9 yellow-cream Garden Roses cut 12.5 - 16"
1 bunch Black Knight Scabiosa cut 12.5 "
half a dozen heavy gauge floral wires for the Black Dahlias. 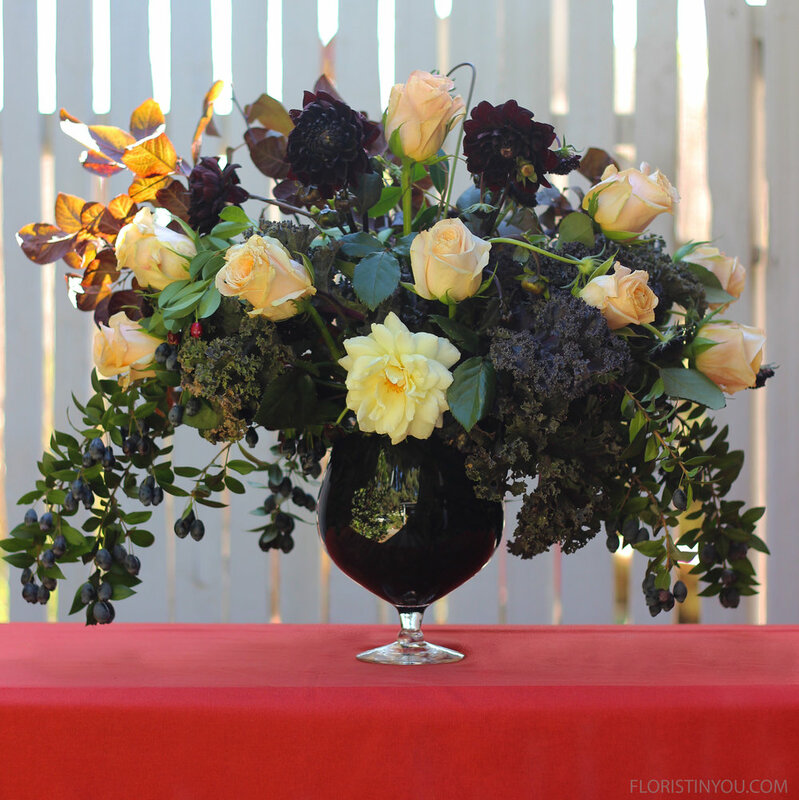 Do you want an arrangement for Halloween that is elegant and a little mysterious? You don't have to have spider webs all over it to set the tone. This will do the fill the bill. I even think Bride of Dracula would like it. 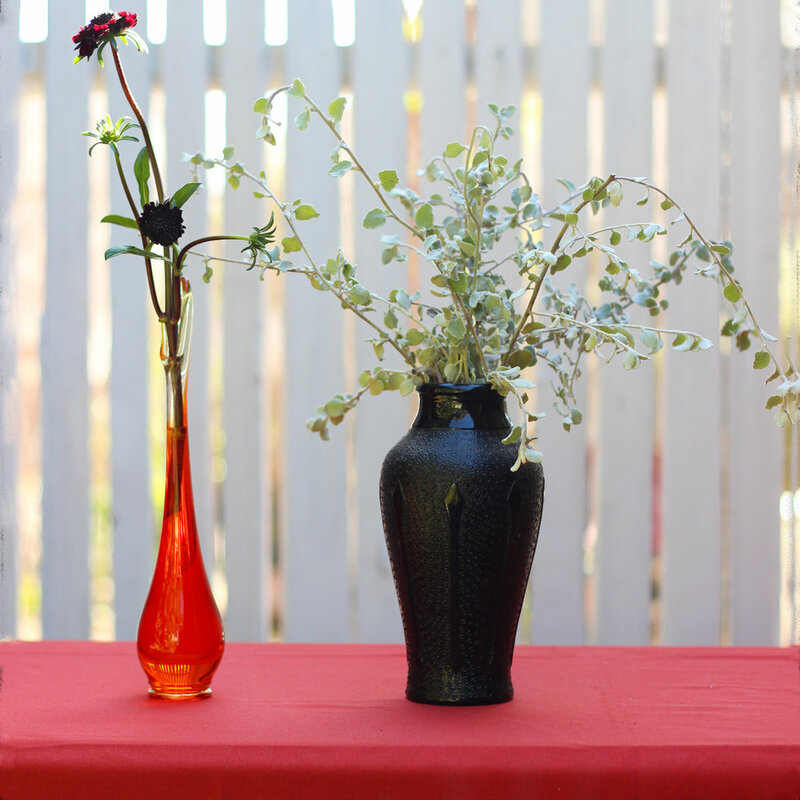 The TRICK for this arrangement is that the vase is a regular glass footed vase, and you just line it with a garbage bag to get the 'black glass' look without having to spray paint the inside of it. Woohoo! Easy! The arrangement is one sided, to set on a console table. If you want it two sided you need to double to roses, scabiosas, and dahlias. There are some red kale varieties that are decorative. Redbor Kale is both stunning and delicious. The kale in this arrangement comes from my husband's organic garden here in Southern California. We eat it year round, sauteed with tomatoes and onions in olive oil. We probably eat it three to four times a week. It is delicious. We also put it in the blender with fruit (a frozen banana, frozen raspberries, some fresh orange juice, a heaping tablespoon of homemade yogurt, and vanilla) to make smoothies. Ya gotta' get your greens. You will need to wire your roses with 1/3 length of 18 gauge floral wire. See: http://www.floristinyou.com/prep Then wire the dahlias with a whole piece of heavier floral wire. Poke the wire right up through the bottom of the dahlia. Then bend the top of the wire back down in a loop with pliers and pull it back down a little so it doesn't show. The scabiosas however, have a mind of their own and they just go where they want to. 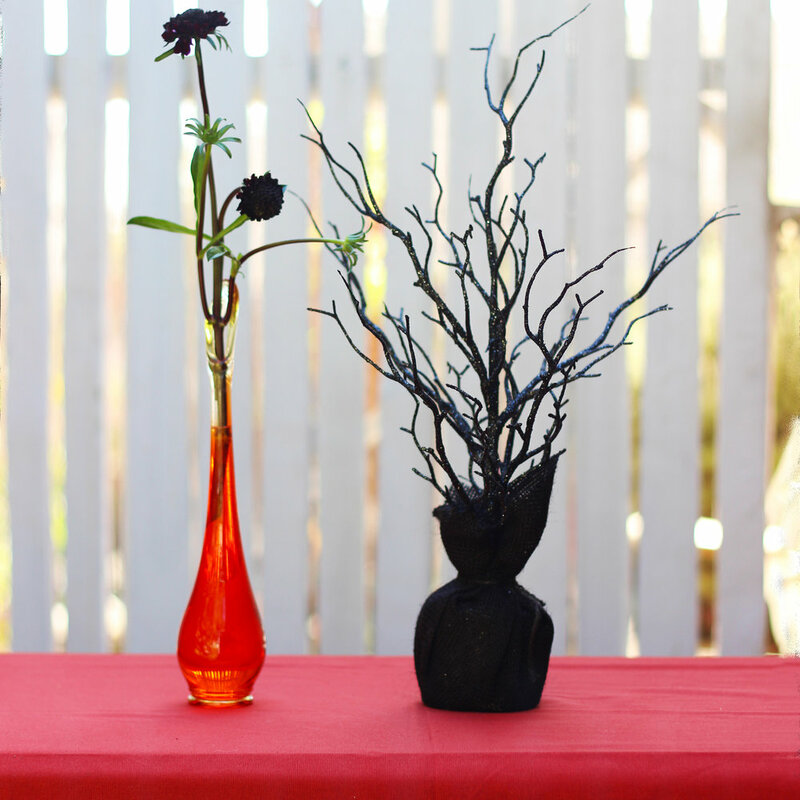 You still have time to decorate for Halloween, so once you have your flowers, let's begin. 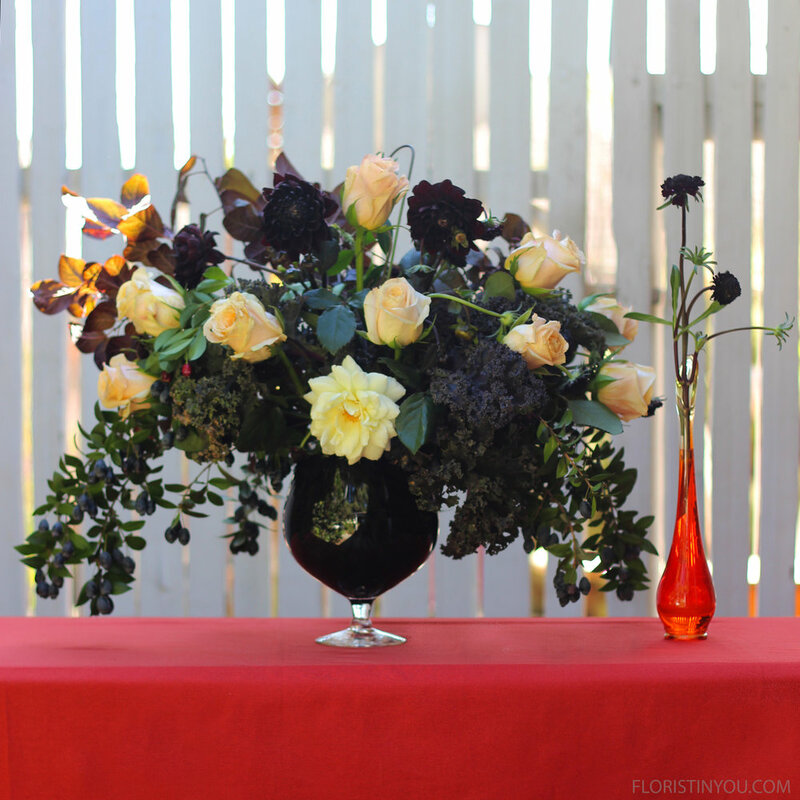 Press end of black garbage bag into large brandy snifter shaped glass vase. Fill with water. Trim the top even with the edge of the vase. 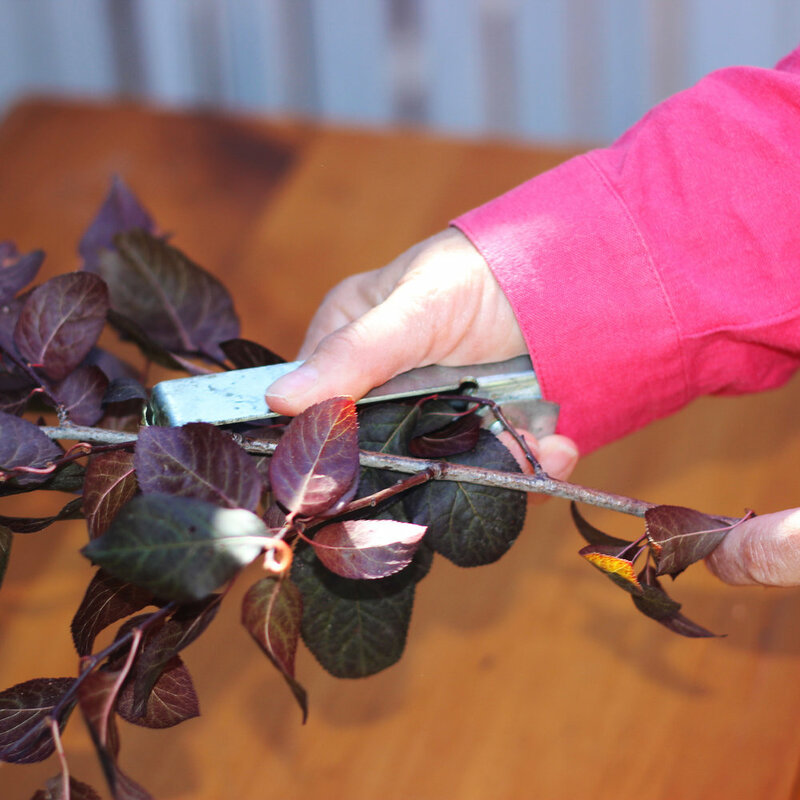 Use floral stripper to take off any leaves that will be below water. Put in vase. Anchor with small stones. Add 3 berry branches, one on each side and one in the back. Add Pepper Berries and kale. Cut kale stems as long as you can. Wire dahlias and add them. Close up of Burgundy Black Dahlia. Add the cream roses and then the white rose at the bottom. 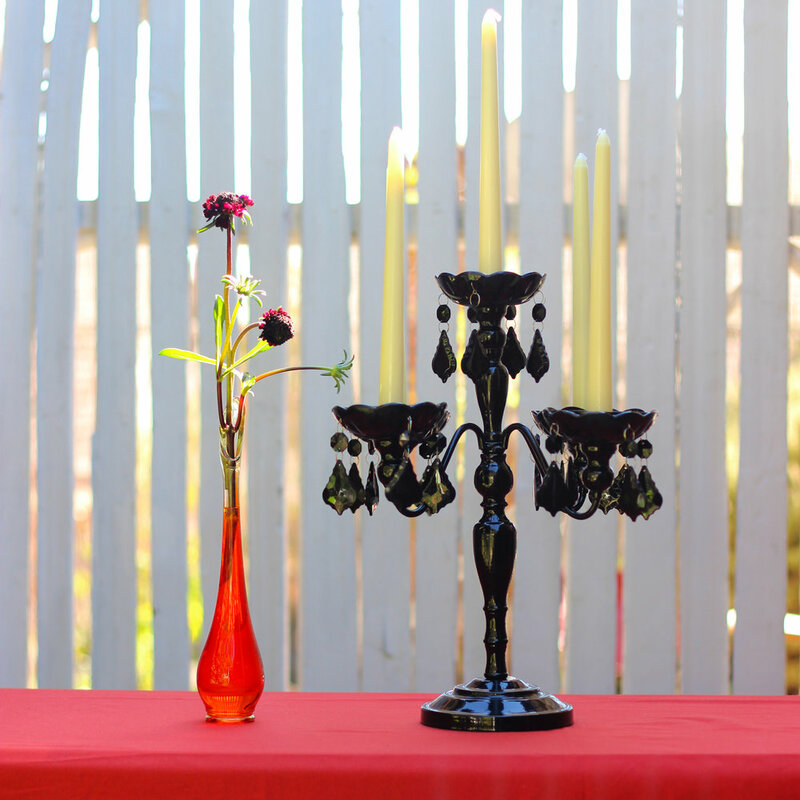 The orange hand blown bud vase compliments the 'black glass' of the arrangement. Add a chandelier with wax candles that will drip. And a sparkly little tree. And this little gem of a vase found in a Pasadena California antique store.